Well worry no more! The next time you or your hypothetical out-of-town friend are craving a good beer and, say, antelope, executive chef Brian Poe and his new Tip Tap Room have got you covered. This Beacon Hill establishment specializes in “tips” of every variety – steak tips, turkey tips, chicken tips, and lamb tips for carnivores, swordfish tips for fish lovers, and even tofu tips for the veggie crowd. But the kicker is the wild game tips, a daily special that rotates among unconventional fare such as elk, antelope, rabbit, goat, buffalo, and more. But tips are only half the story at the Tip Tap Room – there are 36 taps covering an impressively broad swath of beers. Wild game. Craft beer. Dear reader, you are in for an outstanding evening. 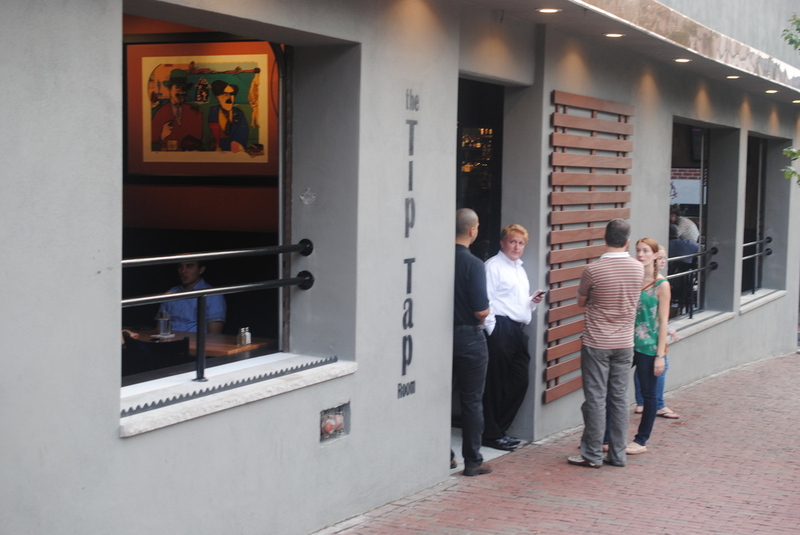 The Tip Tap Room opened a little more than a month ago, replacing the old Shangri-La Chinese restaurant – and if you ever had the misfortune of eating or drinking there, you’ll be relieved to know that Tip Tap bears no resemblance whatsoever to the previous tenant. (Just walking by Shangri-La gave me a dirty feeling.) Completely renovated and refurbished, Tip Tap is modern, minimalist, and positively gleaming. The colors grab you as soon as you walk in. 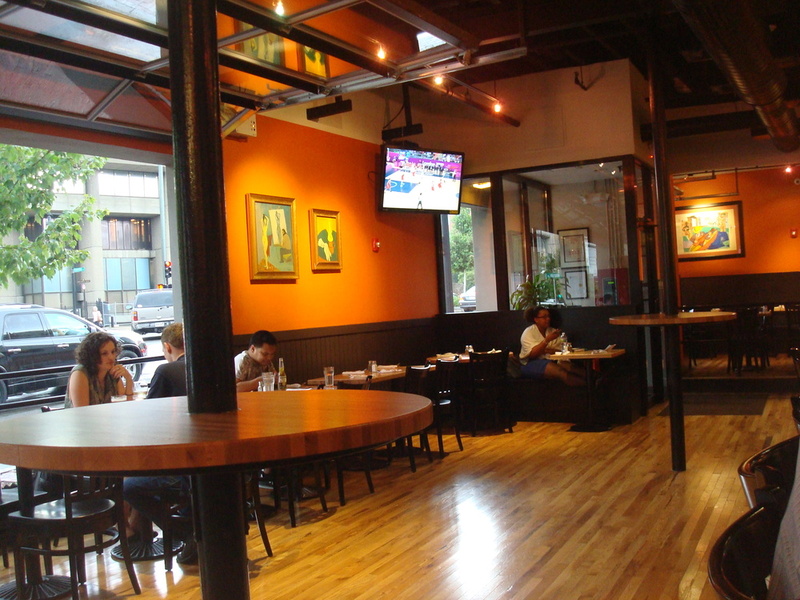 Bright, shiny hardwood floors are echoed in blonde wood table tops and shingles on the walls, complemented by black chairs, a black bar, a black ceiling, and black-clad wait staff. Muted orange paint on the walls, peppered with intriguing artwork, and marbled blue wood beneath the bar give the room a subdued but striking look. Several huge chalkboards behind the bar colorfully display the daily specials and contribute to a pretty casual feel. There are 15 or so seats at the L-shaped bar, six to eight tables opposite that, and a separate dining area with about 20 tables. Best of all, large, retractable windows, like garage doors, open onto the street when the weather’s nice. I first stopped by Tip Tap on the Friday of its opening week, and it was so packed you couldn’t move. Undaunted, I stood by the bar contemplating the splendid draft selection. I eventually settled on San Francisco’s other treat, Anchor Steam. It’s one of my favorites, and not too many bars have it on draft around here. 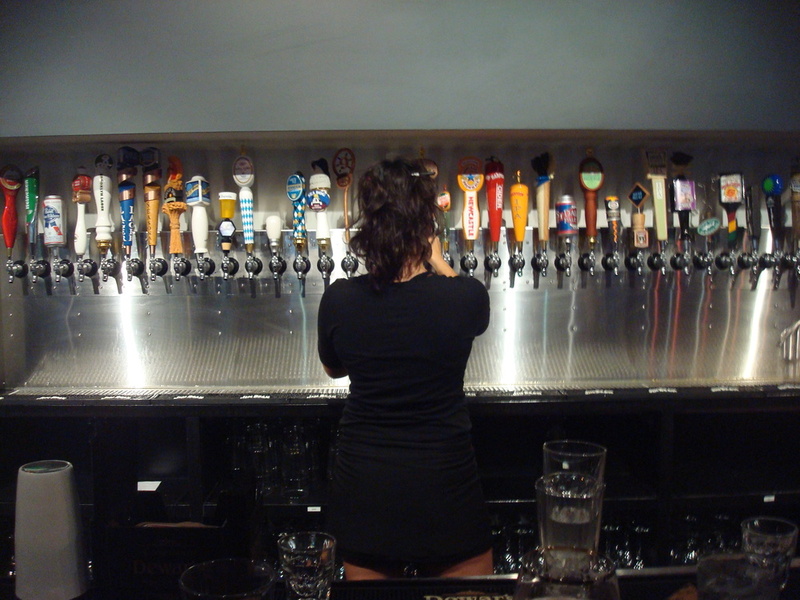 The taps are arranged on a long wall behind the bar and offer a good mix of familiar favorites like Blue Moon, Sam Adams, and Guinness, to choicer selections such as Long Trail and Boddington’s, along with some higher-end stuff for the beer aficionado. Should you prefer something more basic, they have PBR, Amstel Light, and Heineken. 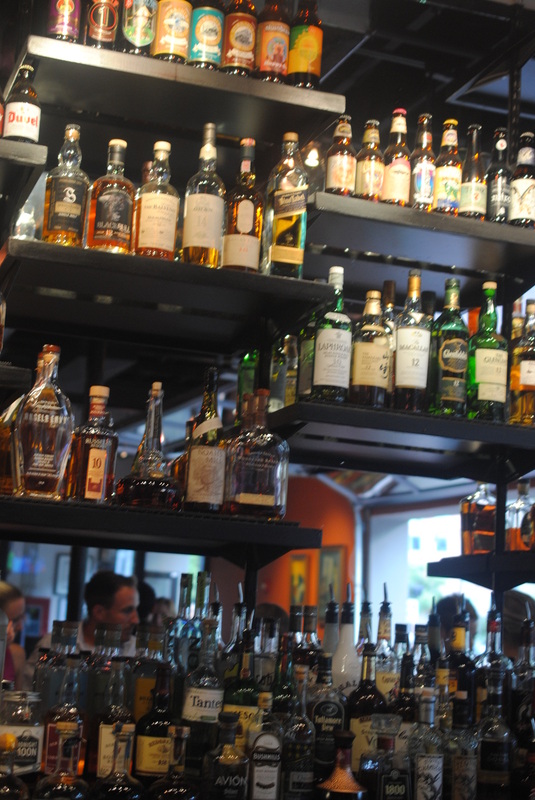 If, remarkably, you can’t find a suitable draft option, you can peruse a lengthy menu of bottled and canned beer that ranges from Coors Light and Miller to Samuel Smith Oatmeal Stout and Chimay. I could come here just for the beer (and since it’s footsteps from my office, that’ll be a regular temptation), but I’d been drooling over the food menu since I first laid eyes on it. So a few weeks after the initial buzz died down, my sister Kelly and I came in on a Saturday night at 8, for dinner. It was busy but much calmer than on my first couple of visits; about 40 people, all told, and we were seated immediately. Forty minutes later the bar area was pretty full, with plenty of standees. After ordering a couple of beers – Dale’s Pale Ale for me, Seadog Blue Paw for Kelly – we began considering our dining options. Tip Tap’s entrées understandably get all the attention, but the appetizer menu offers its share of intriguing pre-dinner bites. Kelly and I started with cheese and cracklin’s – fried goat cheese balls, duck fat fried prosciutto “cracklin’s,” and grilled asparagus tips (more tips! ), accompanied by a chilled carrot ginger dipping sauce. What a combination of flavors! Needless to say, they disappeared quickly. They were replaced by what I’d characterize as highly upscale potato skins. Simply called “potato” on the menu, these babies are served with seven (7!!) types of bacon, including boar, and topped with fried oysters, pickled peppers, and a beer cheese sauce. Pardon me a moment. I’m gettin’ all misty eyed! And then...the main event. Kelly debated between steak tips and swordfish tips, but my mind was made up as soon as I walked in and saw that night’s special on the chalkboard – chimichurri-marinated ostrich tips with smoked tomato cilantro potatoes and Bresaola chive salsa. With only a once-ordered ostrich burger from Fuddrucker’s to use as a point of reference, I find myself at a disadvantage in attempting to describe my entrée. I do wish I had enough past experience with wild game to say “Hmmm, the ostrich is more tender than bear, but not as succulent as elk,” but I’m just not there yet. The ostrich tips looked like steak tips, but the flavor was clearly different. It was a lean red meat, smokey and rich, and apparently very low in cholesterol. Overall? Outstanding. Kelly, the same person who only a few weeks ago, nonchalantly ordered a drink containing tequila and grappa, is not so daring in her food choices. She went with the steak tips, which garnered high praise. The Tip Tap Room’s more conventional offerings are prepared with the same skill and care as the wilder options, so you don’t need exotic tastes to enjoy a great meal here. I, on the other hand, will probably try every weird meat that Tip Tap grills up. That said, sometimes there’s a non-wild-game special, like scallops or sea bass. And the specials appear on pretty short notice, so if you have your heart set on elk tips, don’t be disappointed if they only have buffalo. But cut Tip Tap a little slack. After all, Brian Poe has to make frequent trips to the woods of northern New England, not to mention his travels to south Central Asia, Africa, and the Australian Outback, to hunt these animals down, which he does using only a crossbow or, if he’s craving a challenge, his bare hands. (I have not confirmed this.) That sounds like a lot of work, and between Tip Tap Room, Poe’s Kitchen at Rattlesnake, and another new restaurant in the works, the man can’t be everywhere at once. Nevertheless, you can always check the website or call ahead to see what that day’s special is. And if you find yourself with the “same old” wild game offering on subsequent visits, don’t despair – even if it’s the same meat, it may be prepared quite differently. Ostrich, for instance, was back on the menu about a week after I ate there, but this time it was marinated in basil and Malbec, with coriander grilled peaches, roasted red jalapeno, and blue cheese vinaigrette on Dale’s Ale polenta. I could talk ad nauseum about the food, but this is a bar blog, after all. And since no post would be complete without a cocktail, I had to make one last trip to Tip Tap. I went in with a few simple, blog-related objectives: order my obligatory mixed drink; maybe try one more interesting beer on draft, and an appetizer if I’m feeling peckish; get a few last pictures to round out the post. In and out in 30 minutes. Thirty-six taps aside, Tip Tap sports a very respectable list of bourbon, scotch, and whiskey, and it’s the first place I’ve been to since Five Horses that has moonshine on the drink menu. Bottles of liquor arranged in a gorgeous ceiling-high display behind the bar are enough to put anyone in a cocktail mood. The bartender told me they’re still working on the drink list, which should be ready in a week or so, but that she’d be happy to make me whatever I liked. I opted for my old standby, a Manhattan. It might not be the most original choice, but on a day that was dark and humid, punctuated by torrential rain, it seemed like the right drink. The bartender placed in front of me a perfectly and fully frosted glass; I watched the frost slowly dissipate with anticipation as she mixed up my drink. While sipping my cool, well-made cocktail, I had a brief chat with the man himself, Brian Poe, who recognized me from my last visit and asked how the blogging was going. When I mentioned the many glowing reviews I’d seen of his restaurant, he called it “humbling.” Seems like a nice guy, and down to earth. Just like his restaurant. I then moved on to a Kona Fire Rock; two sips in, I felt like I’d found a new favorite. I’ve had this Hawaiian beer it in bottles, but never on draft. Full-bodied flavor, not bitter. Then it happened. As I nursed my beer and soaked up the ambience, I saw on the chalkboard that that night’s game burger special was a yak burger. With bacon. And just like that, my plan to make this a brief visit went right out the retractable window. A yak burger. A yak burger. It’s topped with a beer cheese sauce, because let’s face it – you don’t make something as unusual as a yak burger and then just throw a piece of Swiss on it. 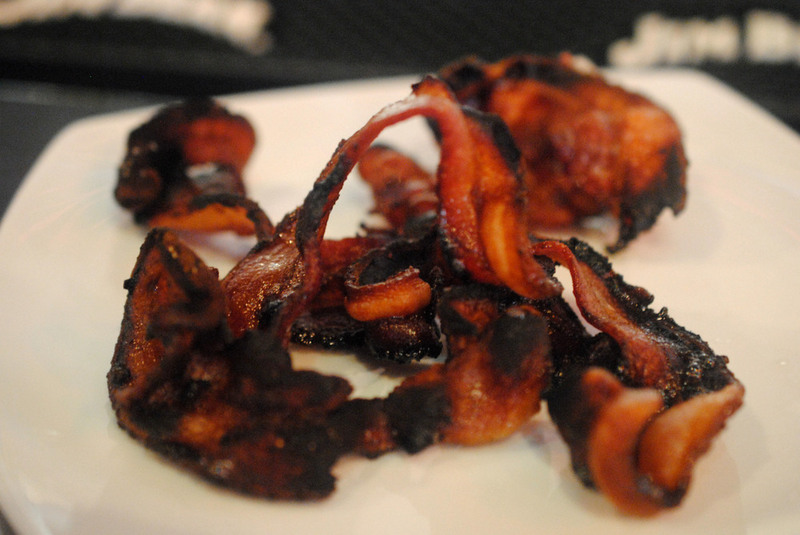 And if you think Tip Tap uses any old bacon, think again. One of the bartenders, Steve, told me that their “Beacon Hill Bacon” is cured right there on the premises and is made with spices used in Boston baked beans (he actually described the process in great detail, but at some point my mind went to a happy place and I missed out on some of the specifics). The burger itself was absolutely delicious, and tasted like no other I’ve ever had. The yak meat had an unexpected sweetness, and the sauce and bacon were excellent complements. Considering all the work that goes into one of these wild game entrées, all the new and interesting flavors, all the thought behind how to best prepare it and complement it with toppings and sides…it would make sense to match the tip with the appropriate tap. Of course, if you’re like me, you might not know exactly what beer pairs well with a yak burger, or, say, marinated rabbit. But Steve helpfully discussed several options with me, and gave me a couple of samples. One of his suggestions was a beer I’d actually been curious about for some time – Kentucky Bourbon Barrel Ale.It’s aged for 6 weeks in a bourbon barrel, resulting in a smooth, strong beer with hints of oak and vanilla. Phenomenal and unique. And yes, it worked perfectly with my burger. 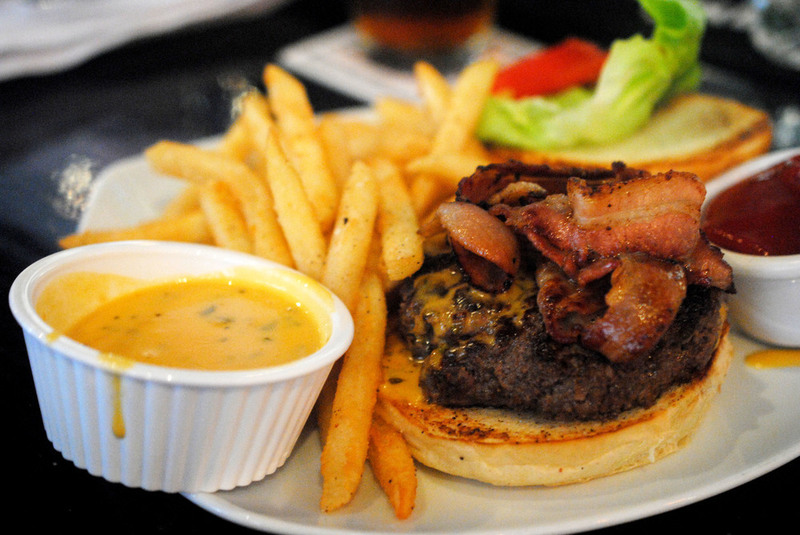 You can get burgers and beer at almost any bar. You can get a fantastic steak and an expensive bottle of Cabernet at a fancy steak house like Abe and Louie’s. The Tip Tap Room comfortably and creatively fills the space between. Casual, but not like a pub; upscale, but not fancy. One of the things that really impresses me most about this place is that it could get by solely on the basis of novelty. Put some kitschy animal heads on the walls, grill up a few unusual meats, snag some curious customers. Instead, the chefs prepare this stuff as if they’ve been eating elk and antelope all their lives. I’ve had venison before; it was served with mint jelly. Very exciting. Yet when venison was on the menu at Tip Tap this past week, it was peppercorn-rubbed and served with parsnip puree, jalapeno jelly, and truffled pommes frites. I’d say that takes some serious culinary know-how. My point is, plenty of people will order something like goat or rabbit simply because it’s different, and it’s to Tip Tap’s credit that their wild game tips aren’t just different – they’re extraordinary. I mean, even their bacon takes weeks to prepare. But again…the food, however unique, is only one reason to come here. It’s an attractive bar with an impressive beer list, and you could just as easily come here for nothing more than a few drinks with your coworkers. It holds great appeal for beer lovers, and the staff really know their products. Both Steve, who offered such great advice on food and beer pairing, and Kristen, another bartender who cheerfully answered my many questions, seemed genuinely excited to talk about the beer list and the food menu. I didn’t get the name of the woman who skillfully prepared my Manhattan, but it was top-notch. And considering the beer options and the uniqueness of the food menu, I can’t wait to see what they come up with for a cocktail list. The prices are pretty fair. Most of the craft beer is about $5.60, and you can get a PBR for $3.75. Some specialty beers will run you more, like my Kentucky Bourbon Barrel ($7.50) or La Chouffe for $12.85, but that’s to be expected. My Maker’s Mark Manhattan was $11.50 (ouch). 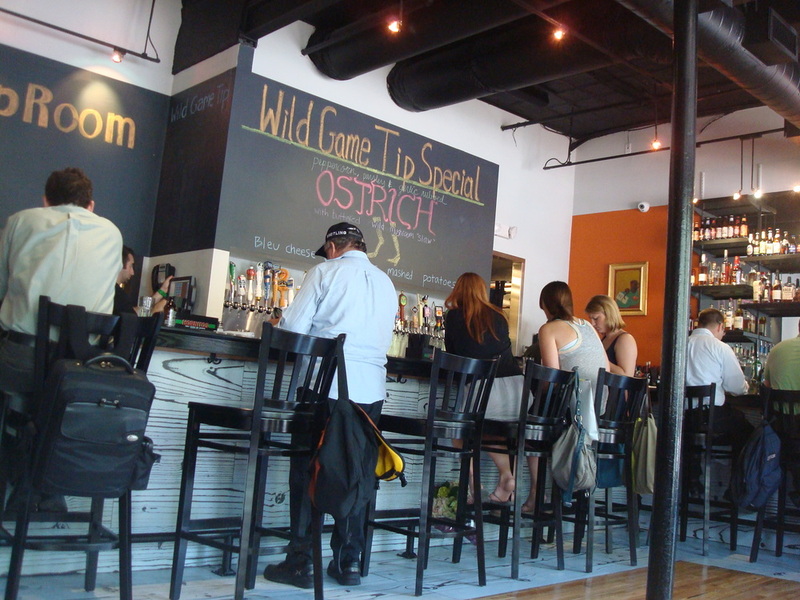 If you’re going with the wild game special, expect to pay about $20 (and if you don’t like that price, just go to some other place that serves ostrich or antelope tips), while more ordinary tips average about $13 or $14. My yak burger was $11.95, which is only slightly higher than the average price of a “normal” burger in the area. Above all – this place is fun. I get the feeling that Brian Poe and the whole staff really enjoy working here, and that makes for a convivial atmosphere. And it’s not often in Boston that you find a menu that offers such unusual options and gives you the opportunity to try something new, bold, and daring.